C. G. A Great Natalian. 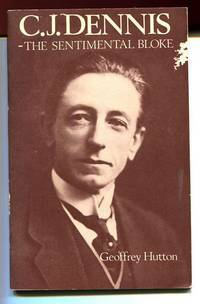 : A Biography Of Sir Charles George Smith, K. C. M. G., K. S. J., J. P.
Durban, C. G. Smith & Co., n.d.. 8vo; pp. xii, 131; colour frontispiece, b/w illustrations, fold-out colour table, some colour illustrations; white boards, title in blue on spine and front, foxing and browning to endpapers, flecking to page edges, mylar dustjacket, a good copy. C. J. Brennan. : An Essay In Values. Sydney, P. R. Stephensen & Co, (1934). . First Edition; 8vo; pp. 165; portrait frontispiece; original green cloth, title lettered in black on spine, dustjacket, browning to edges, marks to dustjacket, flecking to page edges, a good copy. C.J. Brennan. : An Essay In Values. Sydney, P.R. Stephensen & Co., (1934).. 8vo; pp. 165; frontispiece; original cloth, spine and corners bumped, endpapers lightly browned, good copy. Sydney, P.R. Stephensen & Co., (1934).. First Edition; 8vo; pp. 165; frontispiece; original cloth, chipped dustjacket, flecking to page edges, free endpapers browned, a good copy. Rare with dustjacket. C. J. Dennis- The Sentimental Bloke. : An appraisal after 100 years of his birth. (Melbourne, Premier's Department, 1976).. First Edition; 8vo; pp. 51; portrait frontispiece, b/w illustrations; very minor chipping to original stiff wrappers, very good copy. 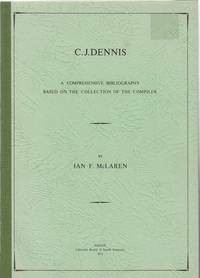 C. J. Dennis: A Comprehensive Bibliography Based on the Collection of the Compiler. By Ian F. McLaren. Adelaide, Libraries Board of South Australia, 1979.. 4to; pp. xvi, 284; frontispiece, 2 colour pasted plates, 24 b/w. illustrations, indexes; original stiff wrapper, with green cloth spine; sticker mark to front wrapper, spine cocked; otherwise a very good copy. C. J. Dennis. : His Life and Work. Sydney, n.p., 1961.. 8vo; pp. 32; 2 b/w illustrations; stiff stapled wrapper, a fine copy. (Melbourne, Premier's Department, 1976).. First Edition; 8vo; pp. 51; portrait frontispiece, b/w illustrations; stiff stapled illustrated wrapper, a fine copy. With Centenary Celebrations Programme. First Editon; Sm. 4to; pp. xvi; 42; 3 illustrations, index, original stiff stapled wrapper, a fine copy. Melbourne, Dalriada Press, 1981. C.J. Dennis. : His Life and Work. Sydney, n.p., 1961.. 8vo; pp. 32; 2 b/w illustrations; stiff stapled wrapper, watermark on front, spine lightly faded, otherwise a very good copy. C. J. Dennis. : A comprehensive bibliography based on the collection of the compiler. Lge. 8vo; pp. xv, 284; portrait frontispiece, 2 colour tipped in illustrations, 2 b/w. plates, 44 b/w. sketch and text illustrations, indexes; stiff green wrapper, minor marks to wrapper, otherwise a fine copy. Adelaide, Libraries Board Of South Australia, 1979. (Melbourne, Premier's Department, 1976).. First Edition; 8vo; pp. 51; portrait frontispiece, b/w illustrations; stiff stapled illustrated wrapper, insect damage to wrapper, a good copy. Signed by the author. (Melbourne, Premier's Department, 1976).. First Edition; 8vo; pp. 51; portrait frontispiece, b/w illustrations; stiff stapled illustrated wrapper, wrapper slightly chipped, previous owner's name on front free endpaper, previous owner's notes on title page, a good copy. C. J. Dennis: A Comprehensive, Bibliography Based On The Collection Of The Compiler. By Ian F. McLaren. Med. 4to; pp. xvi, 288; frontispiece, 2 colour pasted plates, 24 b/w. illustrations some within the text, addenda and corrigenda, indexes; cloth spine with stiff paper covers. Adelaide, Libraries Board Of South Australia, 1979. C.J. Dennis. : A Chronological Checklist Of Contributions To Journals. Adelaide, Libraries Board of South Australia, 1976.. 8vo; pp. vi, 32; references; stiff stapled wrapper, fine copy. C. J. La Trobe. : Contained within the Victorian Historical Magazine. Journal and Proceedings of the Royal Historical Society of Victoria. Issue 93. Vol. XXIV, May, 1951, No. 1. Melbourne, The Royal Historical Society of Victoria, 1951. . First Edition; 8vo; pp. 1-22; family tree; original stiff stapled printed wrapper with faded edges, otherwise a very good copy. C.J. La Trobe. : Contained In The Victorian Historical Magazine. Vol. XXIV No. 1. May, 1951. Melbourne, The Historical Society Of Victoria, 1951.. 8vo; pp. 32; original stiff stapled wrapper, spine bumped, good copy. C.S.I.R. - 1945: Council For Scientific And Industrial Research. Demy 4to; pp. 98; numerous f/p b/w illustrations, original stiff wrapper, a little chipped and discoloured, a good copy. Melbourne, Printed by H.E. Daw, 1945. 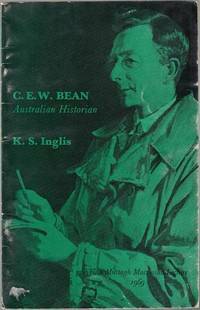 C. W. Bean, Australian Historian. : The John Murtagh Macrossan Lecture, 1969. Delivered at the University of Queensland, 24 June 1969. 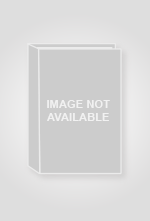 (St. Lucia), University of Queensland Press, (1970).. 8vo; pp. 32; original stiff illustrated stapled wrapper; wrapper rubbed and creased, bookplate; otherwise a very good copy. C. Y. O'Connor. : The Man for the Time. Cyril Ayris Freelance, 1996.. 8vo; pp. 40; b/w illustrations, glossary, index; stiff illustrated wrapper, a fine copy.